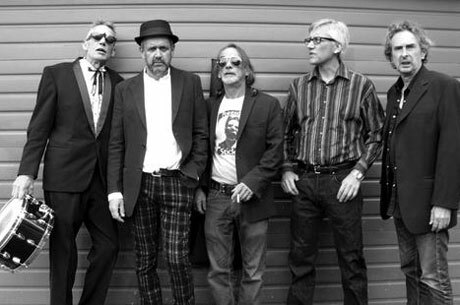 Back in 2009, Vancouver punk legends the Pointed Sticks returned following a nearly 30-year hiatus to deliver their pop-spiked comeback LP Three Lefts Make a Right, but the band's victory lap just might be coming to an end this weekend. A new interview with vocalist Nick Jones hints that the group's Vancouver gig this Saturday (November 3) at the Rickshaw Theatre may well be their last. "If people realize what we're saying is true then they'll come to the show, and if they don't believe us, then I guess they can come see us next time," he told the Georgia Straight. While Jones noted he'd certainly entertain the idea of the odd reunion show, if the price was right, the singer added that it's tough to get together with the band on a regular basis, considering he lives on Vancouver Island in Nanaimo. With things currently as they are, it might be a good idea to end the band on a high note. "You're talking about a bunch of 50-year-old guys connecting once a year," Jones stated of the Sticks' current situation. "And I think everybody feels we've maybe gotten out of it what we needed anyway. If that's the case, why not go out in style?" While the gig could prove to be the Pointed Sticks' final live performance, the band will at least give the fans another album sometime in the foreseeable future. The tentatively titled Missed the Bus is slowly being put together at a Vancouver studio, though an ETA has yet to be offered up for the platter. "We were hoping to have it out in time for the show, but in Pointed Sticks world, things like that never actually work out properly," Jones lamented.